The Chairman of Ilorin base Abubakar Bukola Saraki (ABS) Football Club, Seni Saraki has urged the national U-17 team, the Golden Eaglets to do the nation proud by winning the AFCON in Tanzania. Saraki, who paid the team a courtesy visit on Tuesday at the training pitch of Package A of the National Stadium, Abuja also pledged to be in Tanzania to cheer the team. 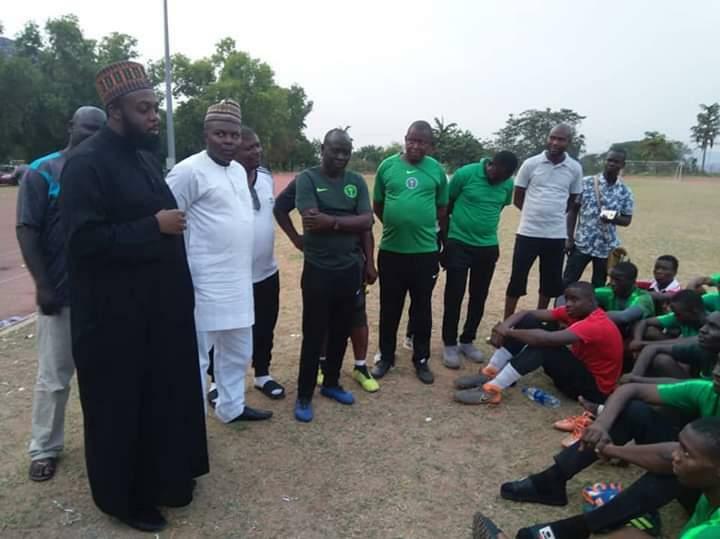 Saraki’s visit was to drum support for the players ahead of the West African U-17 qualifiers, and to specifically boost the morale of two ABS FC players in the team, Olusegun Olakunle, and Gata Mubarak. The young football administrator, who said he has no doubt in the nation’s ability, especially in the U-17 category, where he said Nigeria has done well in both Africa and world level, expressed confidence in the ability of the current team to win the title again. He pledged the sum of N500, 000 to the team. While receiving the Chairman after their training, the Head Coach of the team, Coach Garba Manu expressed confidence in the ability of the players and the coaches to qualify for the World Cup. Coach Manu, who was among two sets of Eaglets that have previously won the world titles said that he will rely on experience and Nigeria’s pedigree at the youth championship. He commended Saraki for the support, and ABS FC for producing two talented players, Olakunle and Gata, who are now an integral part of the team.